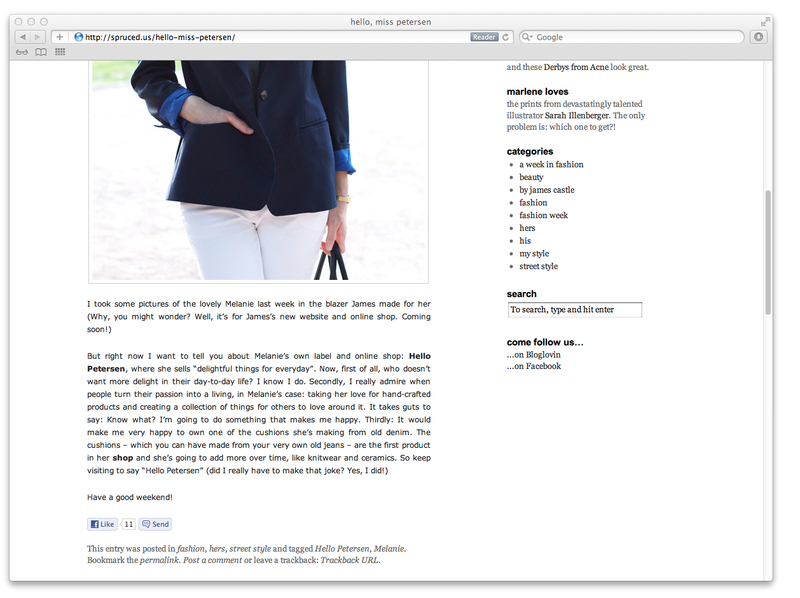 Recently PETERSEN was featured on one of my very favorite fashion blogs spruced.us! The blog has been founded by fashion designer James Castle and fashion author Marlene Sørensen about a year ago and by now they have such a huge and impressing community of fashionistas following them and their humourous style advice week after week. On the photo below I am wearing my hand-sewn blazer in ultramarine by James Castle. It was named “The PETERSEN”! What an amazing experience to get myself a handmade piece of fashion by this incredibly talented designer. You can find his brandnew online shop here! And also, please visit Marlene and James on spruced.us. I am pretty sure you will become just as addicted to their weekly fashion posts as I am!